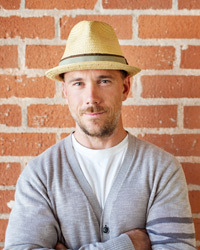 Chef Quinn Hatfield is the co-owner of Hatfield’s and The Sycamore Kitchen in Los Angeles, along with his wife, pastry chef Karen Hatfield (read Karen’s tips here). My croque-madame with yellowtail sashimi, prosciutto and a sunny side-up quail egg on top of grilled brioche. If you focus on the sashimi, the saltiness of the ham plays the role of the soy sauce. If you think of it as a traditional croque-madame, the fish has the creaminess of the cheese. As long as you have access to great hamachi and make sure to toast the brioche, it’s not a hard dish to make at home. What is one technique that everyone should know? Everyone should know how to make an emulsified butter sauce. I have two major variations. One is a classic French beurre blanc. Reduce wine and shallots, and when the pan starts to get very dry, start whisking in room-temperature butter. Maintain the temperature to about 120 degrees, keep it creamy and thick, but not oily, and once you’ve worked in a quarter of the butter, you can go a little faster. If you dip your finger in, it will feel hot, but not so hot that it will burn you. If it feels like bath water, you’re too cool. The other is an emulsified pan sauce. Start with butter, brown it in a pan and then add lemon juice or a shot of vinegar. Add a ladle of chicken stock or water, and boil it quickly. It comes together as a sauce that’s almost as creamy as a beurre blanc. It’s great for home cooks because it’s a simple little sauce that’s really satisfying, and you can pull it together really quick. What separates restaurants and home cooks a lot of times is the saucing. What’s great about celery root is its versatility: It goes really great with butter in a puree, but it’s also great cubed and roasted. What food will everyone be talking about in five years? In five years, everyone will be talking about Middle Eastern cuisine. It truly has not had its deserved time in the culinary spotlight, and I believe that it finally will in the next five years.